On July 1st a new law took effect in Tennessee that allows prosecutors to pursue criminal assault charges if the mother uses illegal drugs during pregnancy. Although it had widespread bipartisan support and is designed to fight Neonatal Abstinence Syndrome, some believe it to be an unconstitutional infraction on privacy, equal protection, and due process. On this episode of Lawyer 2 Lawyer, host J. Craig Williams interviews Tennessee House Representative Mike Carter and Legal Director for the American Civil Liberties Union of Tennessee Thomas Castelli. Together they discuss maximum penalties, the law’s effect on demographics, and treatment based defenses to punishment. Tune in to hear why the Tennessee General Assembly believes this law is their only option and the reasons the ACLU is fighting it. Thomas H. Castelli is the Legal Director for the American Civil Liberties Union of Tennessee. Prior to joining the ACLU, he provided litigation counsel to businesses and law firms with Counsel on Call and was a founding partner with Castelli and Knox, LLP, a small general practice firm with an emphasis on employment discrimination and wrongful discharge. He also worked as an associate at Schulten, Ward & Turner, LLP as well as Sutherland, Asbill & Brennan, LLP, where he focused on employment, construction, bankruptcy and general business litigation. He is a native Tennessean who grew up in Murfreesboro. The Honorable Mike Carter is a House Representative in the Tennessee General Assembly. He is a life-long resident of Ooltewah, Tennessee and practiced law for twenty years before being appointed as Judge, now retired, in 1997 by then Governor Don Sundquist. In 2009, Mr. Carter served as Special Assistant to then County Mayor Claude Ramsey. In 2012, he ran unopposed as a State Representative to serve the people of the newly created 29th District of Tennessee. Carter serves on the House Civil Justice Committee, House Finance Ways and Means Committee, and the House Ethics Committee. He also serves on TACIR (Tennessee Advisory Commission on Intergovernmental Relations) and the House Judicial Oversight Panel. Mike Carter: In Tennessee, the most recent studies insist that neonatal abstinence syndrome, which of course is a child being born addicted, in the last ten years has increased nationwide three times. In Tennessee, it has increased fifteenfold. That is what provoked us to act. Of those neonatal abstinence syndrome babies, 94% are Caucasian. Welcome to the award-winning podcast Lawyer 2 Lawyer, with J. Craig Williams, and Robert Ambrogi. Bringing you the latest legal news and observations with the leading experts in the legal profession. You’re listening to Legal Talk Network. Craig Williams: Hello, and welcome to Lawyer 2 Lawyer on the Legal Talk Network. This is Craig Williams coming to you from Southern California. I man a legal blog called May It Please The Court, and my co-host Bob Ambrogi is off today. Here’s a quick note before we get started; we are conducting a survey to learn more about our listeners and we want your feedback. Is there something you want to hear more about, or a product you want to learn more about? Let us know. Visit legaltalknetwork.com/survey, and take a few minutes to fill out the survey. We’ll thank you in advance for your feedback, and also want to let you know that select listeners who complete the survey will be interviewed for an upoming Legal Talk Network special report. Visit legaltalknetwork.com/survey. Before we introduce today’s topic, we’d like to thank our sponsor, Clio, an online practice management software program for lawyers at goClio.com. On July 1st, a new law took ahold in Tennessee that holds pregnant women criminally accountable if they use illegal drugs while pregnant. More recently, the first woman charged under this new law has come to national media attention. She was arrested two days after giving birth, and has since admitted to using meth days before going into labor. Her arrest has sparked a controversy between state interests and several groups opposed to the recently enacted measures. Here to discuss this topic, we’d like to welcome Thomas H. Castelli. Mr. Castelli is the legal director for the American Civil Liberties Union of Tennessee. Prior to joining the ACLU, Castelli provided litigation counsel to businesses and law firms, with Counsel On Call, and was a founding partner with Castelli and Knox, LLP, a small general practice firm with an emphasis on employment discrimination and wrongful discharge. He also worked as an associate at Schulton, Ward, and Turner, LLP, as well as Sutherland, Asbill, and Brennan, LLP, where he focused on employment, construction, bankruptcy, and general business litigation. He’s a native Tennesseean who grew up in Murfeesborough. Welcome, Tom Castelli. Thomas Castelli: Thank you very much. Thanks for having me. Craig Williams: In addition, we have, joining us today, is Tennessee House Representative Mike Carter. Mike is a longtime resident of Ooltewah, Tennessee, and I know I pronounced that wrong, who practiced law for twenty years and was appointed as a judge in 1997 by then-governor Don Sundquist. In 2009, Mr. Carter served as special assistant to then county mayor Claude Ramsay, and in 2002 he ran unopposed as a state representative to serve the people of the newly created 29th District of Tennessee. He serves on the House Civil Justice Committee, House Finance Ways and Means Committee, and the House Ethics Committee. He also serves on the Tennessee Advisory Commission on Intergovernmental Relations, and as the House Judicial Oversight Panel. Welcome, Mike Carter. Mike Carter: Thank you very much for having us. Craig Williams: Well, Mr. Carter, you voted for this law. It was passed by a healthy margin, and it had significant bipartisan support. It also makes Tennessee the first state protecting an unborn baby in this manner. For the benefit of our audience, can you walk us through the basic elements of the law and the maximum penalty faced by those charged? Mike Carter: I would be happy to. It’s a Class A misdemeanor in Tennessee, which means that you can be sentenced to not greater than eleven months and twenty-nine days in jail, or a fine not to exceed two thousand five hundred dollars or both, unless the statute provides otherwise. That’s what this statute provides. So it’s a standard Class A misdemeanor punishment. Craig Williams: Thomas, what’s the ACLU’s objection to the law? Thomas Castelli: Primarily, we object to it on three grounds. Constitutional grounds. The first would be, we think that it violates the right to privacy, and that kind of goes back into the law the case was growing out of, Roe V. Wade, dealing to a woman’s right to privacy with regard to her own body and procreation. We think that it violates the Equal Protection Clause to the 14th Amendment, this is a crime that can only be committed by a woman, and we also think that there may be some issues, some due process issues with the vagueness of the law, particularly with exactly what the definition, and I think you may be getting to this sometime later, but the definition of things like “harm” or “treatment” that were written into the law. Those are kind of broadly the three constitutional problems that we’ve identified with the law. Craig Williams: Does the ACLU plan on filing a challenge to the law? Thomas Castelli: We’d like to challenge the law. Now, to challenge the law requires that we have someone with standing that’s willing to challenge it. Until that person comes forward and seeks our help, we’re just trying to do what we can to bring some attention to the law and make everybody aware of its existence. Craig Williams: Representative Carter, if the ACLU does end up filing a challenge, what’s your thought, about this? You were a sitting judge at one point in time, so you have some things to offer about this. Mike Carter: Yeah, if I could. I described a black and white punishment that comes from potentially being charged with a violation of the law. First I would like for everyone to understand why I supported this bill. One of the things that I saw when I was a sitting judge, was I constantly had young pregnant women before me, severely addicted to drugs. I was constantly reminded that there was little if anything I could do to help the mother. Remember. Motherhood is one of the strongest instincts known to exist. When a young woman is addicted to drugs, and sells her body, breaks in, does any number of criminal acts, in order to get twenty dollars to get a fix of methamphetamine primarily, then she is fully addicted. She is not thinking rationally. I did not support this bill to punish her. I supported it so that the frustrations I had when I was a judge, of not being able to help her, I could go back and help my brothers and sisters on the bench to have a method of offering assistance to these women. Remember, this bill was passed in an atmosphere of where there is already a Safe Harbor provision in the Tennessee law. A person can exempt themselves from the prosecution of this act by one of two methods. One, by the very bill itself. Checking in, becoming involved in a drug rehabilitation program, you cannot be prosecuted. Prior to that, and in existence prior to this law, is what we refer to affectionately as the Safe Harbor Act. I think it was started in 2012 or 2010. Fairly recently. I was not a member of the legislature that time, so I don’t know exactly when it started, but it’s been about three or four years. My research yesterday and today, I cannot find a single woman who has taken advantage of the Safe Harbor Act. Let me briefly explain what that does. That says, if I go in for a checkup, I go in to see a physician and I’m pregnant and I’m obviously addicted, if I reveal that addiction to the doctor, and the doctor refers me to a rehabilitation or a program to help me with my substance abuse, the Department of Children’s Services cannot use my circumstances in any way to take my children away from me once more. As I said a few minutes ago, the latest results came in. I haven’t found one person who has taken advantage of that. If we start this conversation, at the Legislature in Tennessee, and both Liberals and Conservatives, broad base of support for this bill on both sides of the aisle. We did not look at this bill as a way to punish a pregnant woman. We looked at this bill as an opportunity, a tool that we could use to assist her with her addiction. In my nine years on the bench, I cannot tell you how many people were before me. We once did a survey and we opined that 85% of all of our criminal cases were drugs or drug-related. Not drug possession, I’m talking about they broke into your car in order to steal your stereo to sell it to get crack or meth, et cetera. Have to understand. Putting these people in jail, punishing them, putting a fine on them, giving them ninety days in jail, is an absurd response to the issue before us. The issue before those sitting judges, and those D.A.’s, and the probation officers at work in court who want to help this young woman change her life, is that we had no way to do that. Now the cold, hard reality of addiction is, you’re not talking to, for the most part, a rational thinking person. You’re dealing with a person who has an illness. Who is addicted, and cannot think logically. We can’t set them down and explain that they’re harming their child in an in vitro situation, that they’re killing themselves, you can’t do that. The only thing that most of the folks will respond to is the threat of prosecution. We do not have the jail space, nor did I know of any judges who had the inclination to punish people for being addicts. That’s an absurd result. When I first read this bill, I said, “Thank you Lord.” This give my brothers and sisters remaining on the bench an opportunity to present assistance to addicted women who will, in time, pass that addiction through in vitro to the child and it will be born with that. That’s the background, that’s the intent, and that’s the thing. When you have a bill that comes before the floor, and it is supported broadly by Liberals and Conservatives, cutting across all lines, and your opposition comes from the far Right and the far Left, when you have the pro-life people and the pro-choice people joining to argue against a bill, you know something isn’t quite kosher. When you have the far Left and the far Right upset with a bill, you’ve got to be doing something right. I’m not speaking for the House of Representatives. I’m speaking for myself. That was the basis for my strong support for the Act. Craig Williams: Tom, one of the things that the ACLU has indicated is that this new law might drive more women to seek healthcare from unlicensed professionals and other bad situations. One of the curious things that I’ve got is that, does this law under the ACLU’s interpretation apply to alcoholics as well as drug users? At some point in time, it is illegal to be drunk, just like it is illegal to use illegal drugs. Is there a problem with that? Thomas Castelli: I think there are a couple of different interpretations of this law as written, and the one that Representative Carter kind of just explained, going with that interpretation, this law only applies to, as a Class A misdemeanor, to pregnant women who use illegal narcotics. That’s defined in the statute by reference to another statute. If that is the interpretation with this statute, which is actually an amendment to an existing statute. If it is limited to illegal narcotics, then that’s delineated … My reading of the definition of illegal narcotics means that it includes any opiate, which would be your morphine, your heroins, your prescription painkillers that are opium-based. It includes marijuana and it includes cocaine. There’s some dispute or some question of whether it actually includes meth. I think it was meant to include meth, but just because of the way the codes are written it might not actually include meth. That will be up to a court to interpret. There’s another way to interpret, though, the statute as written. There’s two sections to the statute. One that basically says that, well, the statute itself is what actually brings embryos or fetuses into the assault statutes in Tennessee, so it defines the word “person” to mean a person and an embryo or fetus. Then there is a section that specifically exempts from exalt statutes, pregnant women with regard to any act or admission concerning their own embryo or fetus. That has now been amended by this statute to say any unlawful act or unlawful admission, or any lawful act or lawful admission. It could be interpreted to mean that if a pregnant woman takes an unlawful act or an unlawful admission with regard to her fetus, that that could be criminally charged as an assault. That hasn’t happened yet. I don’t think that that was also the intent of the legislature when they drafted this. In fact every representative or senator that’s talked about this, including Representative Carter, has said what they are targeting is misdemeanor assault for women who are using illegal drugs. I don’t think that if we went off of legislative intent, that this would cover women who abuse alcohol, or drive drunk, or do anything else that’s unlawful that might lead to the result that causes harm to a child once born. This would only include the pre-natal use of illegal narcotics as defined by the statute that causes harm to a child post-birth. Craig Williams: Mike, what’s the boundaries of this law? Is it feasible that at some point in time, a man who uses drugs before he impregnates a woman may likewise be punished under this statute? Mike Carter: No. No basis whatsoever on the statute for that. Can I give you a little background? I appreciate Thomas’ comments there, I think they’re right on target. Mike Carter: This bill is limited to the quote illegal use of a narcotic drug. Now, interestingly, and let me say on behalf of the legislators throughout the world, it’s a whole lot easier to be a judge and say “What did they mean by that” than to be a legislator and make sure that we write that statute just without any errors. Last night when I reviewed the statute for today’s show, I said “Narcotic? Why did we say the word narcotic? And did we define narcotic to include methamphetamine?” Well, why? In Tennessee, the most recent studies is that that neonatal abstinence syndrome, which of course is a child being born addicted, in the last ten years has increased nationwide three times. In Tennessee, it has increased fifteenfold. It is an alarming problem in the state of Tennessee, and primarily in certain areas of the state of Tennessee. That is what provoked us to act. Of those neonatal abstinence syndrome babies, 94% are Caucasian. This is, when I was on the bench, I discovered an amazing thing. When I first went on the bench in ’95, crack cocaine was wildly popular. It applied to all races, all ages, everything. As methamphetamine became into the forefront, here in Tennessee at least, and became very popular, it divided along racial lines. It’s amazing to sit on that bench and watch day after day. I saw the groups divide. I saw the African-Americans go with crack cocaine, and the Caucasians go with methamphetamine, and Hispanics simply go to work. I divided them into three general categories. What you’re seeing now is, this statute is directed primarily by its impact will be 94% of those people are Caucasian that it will affect. I have no racial divide in this myself, but practically, that’s where the division comes, because it’s a methamphetamine epidemic in Tennessee. That’s primarily our thrust and our intent. I’m speaking only for myself and for no other member. I guess because I’m the only judge in the House, retired judge, I have a unique perspective, right or wrong, valid or invalid. My perception is to sit there and see these women and not be able to do anything about it. Of course I could tell them, “I hope that you’ll go, I hope you’ll do this, I hope you’ll do that”, but remember, addicts are ill. They cannot respond responsibly, the vast majority of them. When a young mom, a pregnant woman, will sell herself, steal her grandmother’s jewelry, do whatever it takes to get $20 for another fix, then we’ve got someone that we’ve got to get their attention. I don’t see this as punishment, being vindictive. I’m not aware, and I go to the judges’ conferences every year. I’ve never met a judge that wants to put an addict in jail. That’s like giving them a paintbrush and telling them to paint the wall and they’ll be healed when they get through. We must address the issue, and we must help these people end their addiction now. If we don’t have a statute that allows us to get their attention, and the only threat we have over them is the threat of incarceration. Let me finally say this: They have no fear of being locked up. That does not touch an addict’s mind. What the incarceration does to the addict, it threatens them with time without the drug. Do you see that difference? We have to put that in the statute. Simply to get them to a point where we can set them down and say, “If you will do this, this, and this, there will be no prosecution”. Even to the extent that we put that in the statute, that if they’re going to be charged, and they agree to go in to an addiction recovery program, they cannot be charged. Craig Williams: Mike, I need to interrupt you for just a moment, and pause for a second before we move on to our next segment, to take a quick break to hear a message from our sponsor. We’ll be right back. Hi, my name is Kate Kenny from Legal Talk Network, and I’m joined by Jack Newton, President of Clio. Jack takes a look at the process of moving to the cloud. Now, how long does it take to move to the cloud, and is it a difficult process? No. With most cloud computing providers, moving your data into the cloud is something that takes just minutes, not hours or days, to do. You can get signed up and running with most services in just a few minutes, and even if you have an existing legacy set of data that you want to migrate to a web-based practice management system like Clio, there’s migration tools and migration services that we’re able to offer to ease that process. Most firms can be up and running in the cloud in less than five minutes and can have their data imported in a matter of hours or days. We’ve been talking to Jack Newton, President of Clio. Thank you so much, Jack. Thank you, and if you’d like to get more information on Clio, feel free to visit www.goClio.com. That’s goClio.com. Craig Williams: Welcome back to Lawyer 2 Lawyer. I’m Craig Williams, and with us today is Thomas Castelli from the American Civil Liberties Union of Tennessee, and Tennessee House Representative and retired judge Mike Carter. Mike, I apologize for interrupting you right before the break, but if you want to finish your thought, please go ahead. Mike Carter: My concern, and I’m sure Thomas’ concern, is that we need to do something to help these women have productive, addiction-free lives. This is our first stab at it. Remember, that Tennessee had a law in effect that did exactly the same thing from 1983 to 2012. There was an amendment to that law that inadvertently, or certainly without knowledge of the House, eliminated this statute where a mother could be charged. It’s what we used to call the old crack baby statute. We do have about a twenty-five year history to look back and see if they’re going to be discriminatory acts, are there too many prosecutions, is this helpful or harmful? Lastly, because the pro-life people and Representative Bill Dunn of Knoxville is just one of the most uniquely amazing, a great thinker, a compassionate man, a great representative. His wife is one of the leaders of the pro-life movement in Tennessee. For him to come to me and say “Mike, I oppose you on this”, I had to stop and think about that. When you have the pro-life people saying “No, we’re afraid we’re going to drive women into abortions as opposed to jail”, I think people are not looking at what’s actually happening in our courts. We don’t put these people in jail. There is nowhere to put them. To put them there is an absurdity to begin with, and number two there is no room. They need to be in policies and programs that will help them beat their addiction and lead them into a positive. Craig Williams: Mike, let me bring Thomas in here for a second, and let me ask a question to him. Thomas, if a baby dies as a consequence of a mother’s drug use, does this statute give the opportunity to the prosecution to charge that mother with murder or some type of involuntary manslaughter? Thomas Castelli: No, the statute only affects aggravated, not aggravated, simple assault. If the child dies the mother can be charged with simple assault. The bill as it was originally proposed was to amend the homicide statutes, but that was dropped at some point during the process. What came, what actually came to the vote for the General Assembly was just amending the statutes that have to do with assault. There is no, at this point, no vehicle for a prosecutor to charge a woman with murder or any homicide-related offense, and in fact there is still the language in the homicide statute that specifically says that a woman cannot be charged with homicide for any act or admission that she may take with regard to her own fetus or embryo. Craig Williams: There’s been some claims, Tom, of some rural women in Tennessee not having any access to the treatment programs that are required to invoke the safe harbor exemption under this statute. Do all women in Tennessee have access to these treatment programs that provide this exemption? Thomas Castelli:That’s one of the things that I’ve been hearing most through my conversations with the folks out there in Tennessee that are involved in drug addiction treatment. There’s not enough access to that type of health care here in Tennessee. The point of this law is to either drive women to get drug treatment before they get pregnant or while they’re pregnant, or is to encourage women who are addicted to seek out that treatment, nothing in the law or no other law expanded the access to that treatment. From what we know, from what I’ve been told by people in the industry, there’s about seventeen facilities in the state that actually treat pregnant women with drug addiction problems. Of those, there’s only two that can accommodate a woman and other adult children … Not adult, other children. Two facilities in the entire state that can treat both a pregnant woman with an addiction and also accommodate her other children so that she does not have to split her family. There are situations, for example, one of the highest rates of NAS in the state is Sullivan County, which is up in the Northeast corner of our state. The nearest treatment facility to Sullivan County, which has this high percentage of NAS, for inpatient residential treatment for pregnant women, is Knoxville Tennessee, which is about a hundred and ten miles away. There’s a lot of concerns that woman … and Sullivan County is not necessarily rural. There’s, the tri-cities up there is a fairly populated area of the state, but there are much more rural areas in the state that may not have access to a residential drug treatment facility. That’s another problem with this law. It says, if you seek treatment before birth and complete the treatment after birth, then you have an affirmative defense to the prosecution. Not that you cannot be prosecuted, but that you may have a viable affirmative defense. If you can’t get treatment, because the waiting period for some of these programs are six to eight months, or if you get turned away because you don’t have, say, the means either to pay for treatment or the right insurance to pay for, to get you treatment, then you can’t avail yourself of that affirmative defense. Craig Williams: So, Mike, what’s the State’s response to that? It sounds to me as if there may be some issues. Mike Carter: The response, and I appreciate Tom’s position, but the statute does not require residential treatment. If we’re talking about residential treatments where a mom can go on with other kids, nationwide there are very few of those. We’re talking about a rehabilitation program. It may be at a local community center, it may be county or city sponsored. There’s no requirement that it be residential. There’s none of that. There are multitudes of these programs that do drug testing or counselling. Our problem is, it is extremely difficult to let that person make their own decision to go. They have to have some encouragement, because they’re not thinking straight. There are plenty of programs out there. There may not be the programs that the woman wants, but in their condition, they’re going to reject virtually every program. I understand there are very few residential programs, but the statute does not envision residential programs at all. Craig Williams: Mike, what is the Legislature’s rationale for not including alcoholics in this statute? Mike Carter: Because it rarely affects Neonatal Abstinence Syndrome. Right now, as I said, 94% of those are Caucasians who are affected by methamphetamine. It’s a very minute part of this. In fact I don’t even have any figures for what number of children are born addicted to alcohol. That’s how low on our reports in terms of the numbers were so small that it didn’t even make the reports. Craig Williams: Well, thank you. Well, it looks like we’ve reached the end of our program. We’d like to thank our invited guests, Tom Castelli from the ACLU and House Representative and retired judge Mike Carter, to share their closing thoughts and contact information. Thomas, let’s start with you. Thomas Castelli: Sure. The best way to get in touch with us here is go on our website at www.aclu-tn.org. That’s www.aclu-tn.org, and the contact information for our various departments would be there. If you’re looking for legal help, there’s actually a Get Help button you can push, you can fill out a form to submit a claim to the ACLU. Craig Williams: And Mike? Your final thoughts and your contact information please? Mike Carter: Well, my final thoughts are, I think Tom and I, everyone agrees that we need to assist people in getting off drugs and so anything that will help and assist with that, I’m going to be in favor of. I hope that this bill works. It sunsets after two years. We’ll be able to study the past and the present to see if it’s effective, and if it’s not, let’s do something else. We need to help these folks not hurt them or punish them. Although they may create criminal acts, I don’t view them as criminal, and I dealt with them for nine years day to day, so I hope I have a little experience in that in the real world, not in the theoretical or the stereotypical world. Anyone that would like to contact me concerning this is welcome to do so. They can e-mail me at rep, R-E-P dot Mike, M-I-K-E, dot Carter, C-A-R-T-E-R at capitol, C-A-P-I-T-O-L, dot TN dot gov. I’d be happy to have anybody’s inputs on this, and Tom, if you hear anything about it, or anything that you think I’d be interested in, please call me. Let’s stay in touch on it, and hopefully see that this turns into a positive thing. If not, we’ll change it and do something better. Craig Williams: Great. Thank you gentlemen, we very much appreciate it. Now we’ve come to the point in the show where I’ve got thirty seconds to share my closing thoughts before I get cut off by the buzzer, so here we go. It seems like a very well-intended statute. I understand some of the constitutional issues raised by Tom that concern me greatly regarding the effect of this on women as opposed to men. I also see it being applied in a way that is not, is narrowly restricted to drugs, it doesn’t include alcohol despite the apparent low incidence of alcohol-related issues with babies. Maybe it’s more prevalent in other states than it is in Tennessee. Sounds like a good way to go, just looks like there will be some difficulty in applying it and making it work. I know that we want to protect babies and protect mothers, but this may not be the best way to do it. At least, that’s my sense of it. That brings us to the end of our show. I’m Craig Williams. Thank you for listening. Please join us next time for another great legal topic. When you want legal, think Lawyer 2 Lawyer. 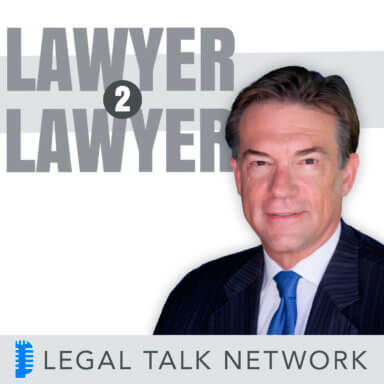 Thanks for listening to Lawyer 2 Lawyer, produced by the broadcast professionals at Legal Talk Network. Join J. Craig Williams and Robert Ambrogi for their next podcast covering the latest legal topic. The views expressed by the participants of this program are their own and do not represent the views of, nor are they endorsed by, Legal Talk Network, its officers, directors, employees, agents, representatives, shareholders, and subsidiaries. None of the content should be considered legal advice. As always, consult a lawyer.